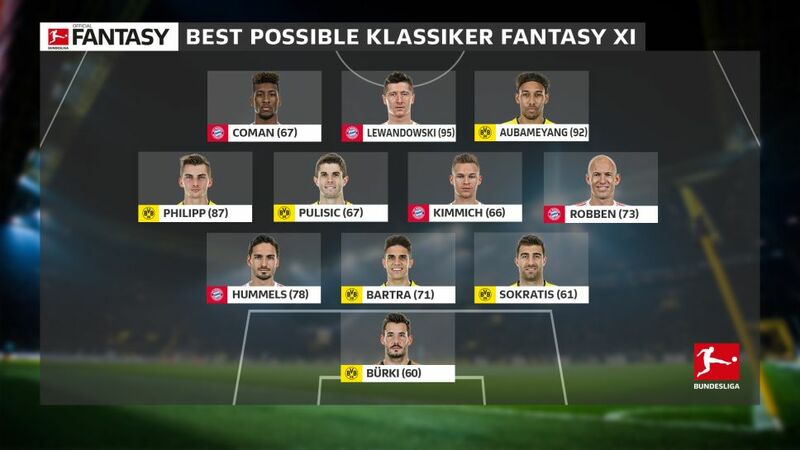 Christian Pulisic, Robert Lewandowski and Pierre-Emerick Aubameyang all feature in the top-scoring Fantasy Klassiker line-up. After much anticipation, the first Klassiker of the 2017/18 Bundesliga season is upon us as Borussia Dortmund entertain the champions Bayern Munich at Signal Iduna Park on Saturday (kick-off 18:30CET/17:30GMT). The Swiss international started the season in fine form, his five clean sheets helping him earn a new contract with the club. He has not enjoyed a shut-out in the five league matches since, but his shot-stopping is among the best in the division. Don’t forget that when it comes to choosing your ‘keeper! The Germany international has been a key part of defence that has conceded just seven goals in ten games, with six clean sheets to boot, more than any other side. Hummels also has a goal and assist this season and could be a major threat from set-pieces against his former club. Like Hummels, Spain international Bartra also has a goal and an assist to his name this season and has amassed an impressive 48 points from won duels. Expect him to be very involved in Dortmund’s attack at the weekend, either at set plays or by starting attacks from defence. An old-fashioned centre-back who loves to defend, Sokratis has also accumulated plenty of points from won duels (41), but has also lost points after conceding a penalty and being sent off earlier in the season. He and Bartra have also struggled to keep clean sheets lately, so bear that in mind when picking your XI! This lad has been a points guarantee in recent weeks, scoring five in his last six appearances, including two braces at Signal Iduna Park. He’s also classed as a midfielder, yet plays very advanced for BVB. These are the things you need to look at when you’re trying to find a competitive edge! Pulisic’s total would be higher had a few more of the many chances he has created been converted by his team-mates. Dynamic and unpredictable, he gave the Bayern defence a torrid time in the Super Cup in August, scoring the game’s first goal. Dortmund’s scourge: Robben has ten goals in 20 games against Borussia, including strikes in a DFB Cup final, a Champions League final and four in the Bundesliga. In short, the Dutchman loves this fixture and could well be worth a punt. In the absence of veteran winger Franck Ribery, Coman has seized his opportunity this season, playing a full part in five league games and scoring a fantastic goal at Celtic in the UEFA Champions League in midweek. Under new coach Jupp Heynckes, the Frenchman has the bit between his teeth and will be eager to get running at what has been a porous Dortmund defence in recent games. With ten goals in ten matches, Lewandowski is the joint-leader of the goalscoring charts and will be raring to go after being left out of the midweek trip to Glasgow. The Pole loves to get stuck in, which should bring in a few more points on Saturday, plus he has a handy knack of scoring against his old club (eight goals in 12 appearances). Those of you who have picked Aubameyang have also been richly rewarded this season. The Gabonese is level with Lewandowski on ten goals and, after a succession of near misses against Apoel in the Champions League on Wednesday, will have a point to prove this weekend. Click here for all things Der Klassiker!